Today we played with pom poms and an empty water bottle. Sometimes it's so simple, but Ethan often seems to really enjoy the simple things. He loves playing with regular things around the house, so you can expect to see a lot of water bottles and boxes lying around! 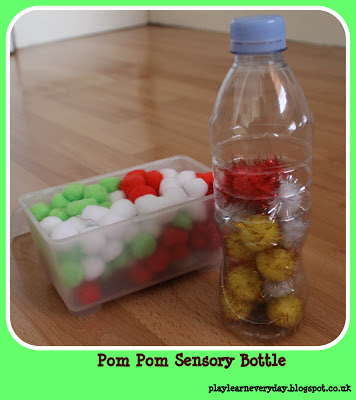 We put the pom poms in one by one, which really helped Ethan with his fine motor control, which is an element of his Physical Development. We also talked about the different colours of the pom poms and the textures, Ethan sometimes tries to imitate the sounds that I make, which is very encouraging. I am hoping that we get some new words out of him soon, as we're always working on his Communication, Language and Literacy while talking through our play.